Placed on 14 February 2015 .
Who doesn’t dream of food at one time or another? Or have cravings, longings, even obsessions? As we become older, the more the mind seems to focus on the foods of our childhood. Readers will be familiar with many of the flavours of my Guyanese past and the memories they bring back for me. In fact, I’m thrilled to see that many of you have also come to like them! Most of my family and friends settled outside the country and I recently linked up with a delightful group of people who share my sugar plantation past. We now live on every continent the world boasts and have ended up in various professional fields. There are large age differences and some of us have never actually met, but our unique childhood has forged a very strong bond. As well as catching up with my old playmates and partners in crime, I have formed a heart-warming rapport with many others. We chat about ‘small days’ and our conversations are hilarious, partly because we all seem to have spontaneously reverted to half-forgotten colloquial Guyanese speech, and type a mixture of standard English peppered with local slang in our comments to each other. To be perfectly clear: it’s just us. No spouses and no children. When I joined the group, I felt like I had found a couple of busloads of cousins all at once. It’s just us cousins having a wonderful time together. But let me tell you how I was invited into the gang. My old pal P. said in her usual airy way ‘You will enjoy it. We talk about dal puri all the time.’ And she promptly launched me as the answer to everyone’s dal puri-making problems. At first I thought she was joking. Now, I see that she was being completely truthful. Dal puri is a near-obsession, especially with the boys. I use the term loosely, as some of the boys have already retired from active work. Even threads about completely different topics net a few dal puri comments. Ideas for serious development of this favourite theme are coming in thick and fast: You-tube video, a separate appreciation society, Skype tutorials and more. So what is this wonderful delicacy known as dal puri? I gave a recipe for it in Warm Bread and Honey Cake and this is how I described it: ‘Dal puri is another member of the paratha family and this is the roti that Caribbean Indians make when they want to lend a festive air to an occasion.’ I also warned: ‘It is one of the more challenging flatbreads to make.’ The ‘dal’ in the name refers to yellow split peas, which have to be cooked to just the right texture before being ground and seasoned and then used to stuff the dough. The entire thing is then carefully rolled out to a thin, neat circle (ideally without tearing the casing) and is then cooked on a tawa or griddle and eaten with curry. Not many of them have Indo-Guyanese roots like I do, with the battalion of dal puri-making relatives that comes with it. They are largely from expat families (although generations long in some cases) and their dal puris were made by cooks, neighbours and friends. They probably remember, as I do, the Sunday cricket matches on sun-scorched green-brown pitches flanked by flame trees with white-painted trunks that echoed the sparkling whites of the players. The high point of the day was the huge and noisy lunch afterwards, with mutton curry and dal puri for everyone on the plantation. They certainly remember something that feeds their craving and they continue to dream of dal puri. It’s not just food for the stomach, but food for the heart and soul. The craving has led to a series of reactions, again mainly among the chaps. The main one is dal puri-hoarding followed by strict rationing. They travel the world (and indeed the Seven Seas) chasing down West Indian roti-shops. They take generous sample tastings before deciding how many to hoard and how to dole it out. They adamantly refuse to share with those who have no dal puri past; that’s just plain wasteful. The finer points are discussed, such as the ecstatic enjoyment of the shower of split pea fragments that rains over the plate when the dal puri is torn for eating. (This happens to be my pet hate.) Some of the more adventurous (or desperate) ones have tried recreating them, with varying degrees of success. One of them, however deserves a medal. He has got the filling – the hard part – down to a scientific formula. It doesn’t matter that it costs him almost an entire day to go through all the stages; it’s worth it! In a mellow mood, I provided them with my simpler recipe and encouraged them to start practicing. However, they feel they would benefit from a hands-on workshop ‘for fine tuning’. Who am I to disagree? I believe that plans are already being made for removing camper vans from Spanish garages and, for all I know, cars are being readied in France, Poland and the UK. I can already see myself making up lots of extra beds and buying large stocks of flour and split peas, but I’ll wait a while, as the venue seems to be getting more and more elastic and shifts from country to country, and even to different continents. The number of would-be participants is growing too. Everybody seems to be looking for dal puri. If you’d like to recreate a warm and sunny atmosphere in your own kitchen, try my quick and simple recipe for seasoned roti wrappers. It’s not dal puri, but it is still very tasty. Eat with curry or with grilled meats, as you like. You’ll find dal puri and many more roti recipes in Warm Bread and Honey Cake and some additional ones in Wrapped. Hi everyone. I’m one of the “… busloads of cousins …” that Gaitri discovered recently and our fun and excitement has increased immensely since. There are 209 comments where Gaitri was introduced to the group when she boarded the bus and the dhal puri (Guyanese spelling) conversation has jumped to many other threads. 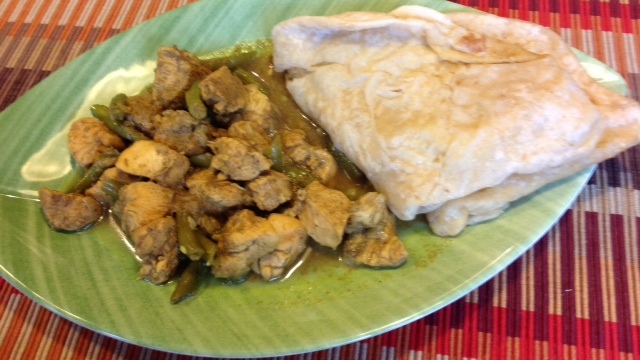 It is perhaps the most important Guyanese (and Trinidadian) comfort food. Dhal puri is as Gaitri beautifully put it : “… It’s not just food for the stomach, but food for the heart and soul.” Any Guyanese, from any social or ethnic background would say. “Yeah, girl, you got that one right!” Such is the power of dhal puri.